Can Gravity Separation Reduce The Impact On The Environment? When some people think of a gold mine, they may think of huge caverns, walls glittering and gold nuggets scattered about waiting to be collected. You’ve struck it rich! But this is far from the truth. Gold is mostly found encased in other rock types and to have a finished product of almost pure gold, we must collect and process the ore. Gravity separation uses high G-forces to extract gold and other metals from the ore. This is the most efficient way of collecting this commodity, but unfortunately, it is not the only way. How Is Mercury Used To Recover Gold? A popular process among artisanal miners is to extract gold using mercury. Mercury has some interesting properties – it’s a liquid at room temperature, has a low boiling point, and acts as a solvent to most metals. Miners submerge their ore in mercury, which combines with the gold but leaves the impurities behind. The mixture of gold and mercury is then brought to a boil, causing the mercury to evaporate, leaving behind mostly pure gold. Mercury is highly toxic to us and our environment. Unfortunately, it is still used today in many mining operations in South America, Africa and around the world. About 180 tons of mercury are dumped into the lakes, rivers, and soils of Peru every year! How Can Gravity Separation Help? Gravity separation uses centrifugal force to separate particles based on their density. Heavy particles (like gold) are collected in the machine while less dense minerals are flushed out. Instead of using a toxic element, like mercury, you can achieve a higher rate of gold recovery using only electricity and water. “At the moment they (the miners) are getting around 50% (using mercury), with these machines they can increase their yield to 80%. That’s guaranteed,” says Walter Torres, an engineer with Peru’s innovation and technology institute CITE. The Falcon SB Gravity Concentrator can help keep people safe and the environment clean when extracting gold. It only uses small amounts of water during its rinse cycle, saving you a valuable resource. It also has the highest G-forces available in the industry, speeding up the gold recovery process. 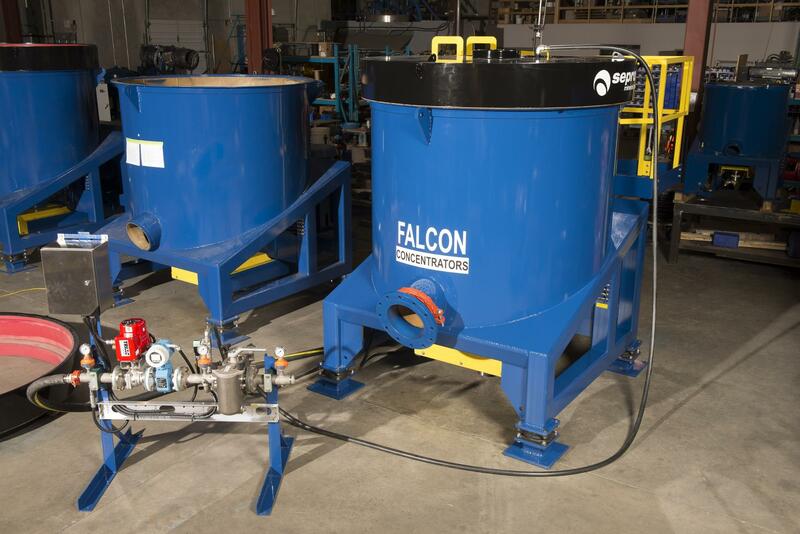 Falcon SB Gravity Concentrators use low water consumption during rinse cycles. At Sepro, we’ve created a small scale version of our Falcon Gravity Concentrator called the iCon specifically to help eliminate the need to use toxic elements in artisanal mining projects. Gravity separation is the most efficient, powerful, and safest way to recover gold. If you’re interested in using one of our gravity concentrators to increase your recovery of fine minerals, speak to one of our experts today.